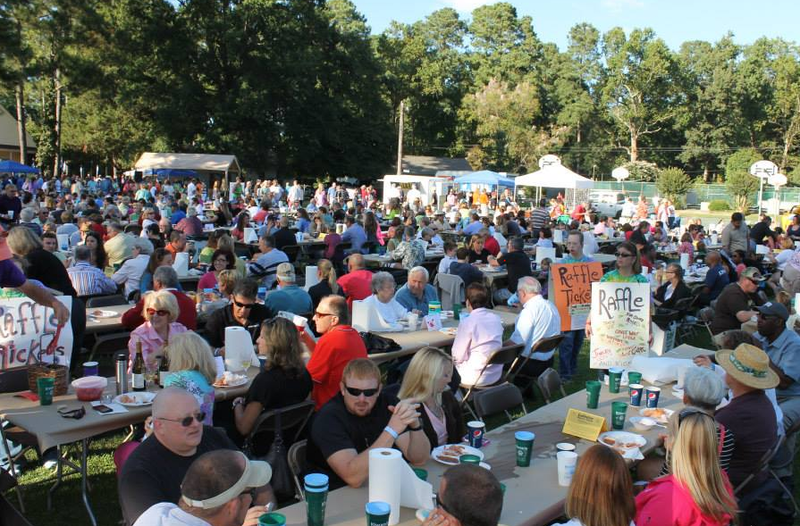 The Williamsburg Kiwanis Shrimp Feast has become Williamsburg VA’s signature late summer family event. Over the past 34 years, it has become a place to see and be seen, a great gathering of community, entertainment and fun. Saturday, September 6, 2014, 4-7PM (Rain or Shine) at the Jamestown 4–H Educational Center on the James River. All you can eat and drink charity fundraiser! Hot and fresh cooked shrimp, hush puppies, beans, cole slaw. Soft drinks and beer. Williamsburg Winery wines available for purchase. Live music by The Hark. Free Parking. Thanks to donations from Williamsburg retailers, there are over 30 items in the onsite Raffle. Click here to check out the Raffle prizes! Proceeds will benefit Bacon Street, Erase the Need, and the Jamestown 4–H Educational Center. $30 from August 26-September 5, $35 at the door on Saturday September 6. The online “PayPal Payment” option accepts your PayPal account or a major credit card: Visa, MasterCard, Discover, or American Express. Back by popular demand! Race in a series of mountain bike trails designed especially for youth cyclists. 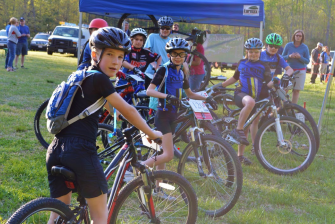 Sign up now for Wednesdays On Your Wheels (WOW), a series of youth mountain bike races at New Quarter Park designed especially for children and families. The WOW series is for kids ages 3 to 18 to develop confidence on their bikes. Races will be staged on three courses. The short course is for children ages 6 and under who ride push, balance, or strider bikes and elementary novice riders who do not use training wheels. The medium course is designed for elementary/intermediate and middle school riders ages 11 to 14. The long course is available for high school-aged riders from 14 to 18 as well as riders in the open advanced class. The open advanced class includes advanced riders aged 13 and under. Participants with clipless pedals are considered advanced. Registration starts September 4. Call 890-3513 for additional information. Click HERE for online registration form. Times: Tuesdays & Thursdays: 9:00 – 10:00 a.m. Tuesdays & Thursdays: 9:00 – 10:00 a.m. Adult Cardio Tennis Workout: Fast paced drills along with fun music keeps this group moving throughout the session. Rallying with different formats is also used in this fun action packed program starting September 11th. Dates: September 10 – 24 October 15 – November 12 Times: Wednesdays: 9:00 – 10:00 a.m. Wednesdays: 9:00 – 10:00 a.m. Cost: $40 3-week session / $20 drop-in $65 5-week session / $20 drop-in Register By: September 5th (drop-in Friday prior) October 10 (drop-in Friday prior) Adult Workout Group: Advanced drills with technique work, competitive drills, strategy, and supervised play compose this advanced group starting September 12th. Dates: September 11 – 25 October 16 – November 13 Times: Thursdays: 10:00 – 11:30 a.m. Thursdays: 10:00 – 11:30 a.m. Cost: $60 3-week session / $25 drop-in $100 3-week session / $25 drop-in Register By: September 5th (drop-in Friday prior) October 10 (drop-in Friday prior) Register by phone today (757) 259-3760! This program is offered at Kiwanis Park Tennis Courts The Williamsburg Department of Parks and Recreation maintains 10 tennis courts within the city limits. These courts are available to the public on a first-come, first-served basis, except when leagues or lessons are scheduled. For more information, please call or email the Williamsburg Parks and Recreation Department at (757) 259-3760. Seven lighted all-weather courts and an adjacent lighted rebound wall are located at Kiwanis Municipal Park. The lights are available on demand daily from dusk until 11:00 p.m., except during January and February. A switch on the pole closest to the access gate for each bank of courts allows players to turn on the lights for one hour. A warning light above the switch comes on with 10 minutes remaining in the hour. If players need additional time, the switch must be activated again within this 10 minute warning window. The tennis courts are located off of Ironbound Road behind the College of William and Mary’s Dillard Complex dormitories. Directions: Turn on Ironbound Road from Rt. 60, then turn right on Tennis Ct. and drive straight back to the parking area behind the first dormitory. The courts are located behind the parking area. Class Times: 8:00 a.m. to 2:00 p.m.
years of age. Children ages 12 to 15 may participate if a parent or guardian is also a member of the class. 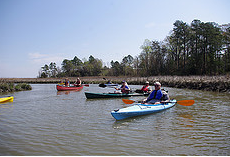 York River State Park will host the annual Estuaries Day Saturday, Aug. 23 , 2014 from 9 a.m. to 3 p.m.
Estuaries Day draws attention to the park’s Taskinas Creek area with a day of estuary and water-based activities including canoeing, kayaking, fossil hikes, fishing programs and more. York River State Park is part of a Chesapeake Bay National Estuarine Research Reserve. “This year’s Estuaries Day event is a fun way to get kids immersed in the outdoors, environmental science and history before the school year begins,” said Jon Tustin, York River State Park Manager. There is no charge for the kayak and canoe trips, but registration on the day of the event is first come – first served. Estuaries Day is free and parking is $4 per car. There will be special displays and activities from partner organizations such as the Virginia Institute of Marine Science, the Mattaponi-Pamunkey Rivers Association and Master Naturalists. A 5K run sponsored by the Colonial Road Runners will benefit the Lafayette High School Cross Country Team and Friends of York River State Park. York River State Park is 2,500 acres of coastal forest and wetlands along the York River. The park offers mountain biking, hiking and equestrian trails as well as the Croaker Landing fishing pier and boat launch area. Click Here for a location map of York River State Park. 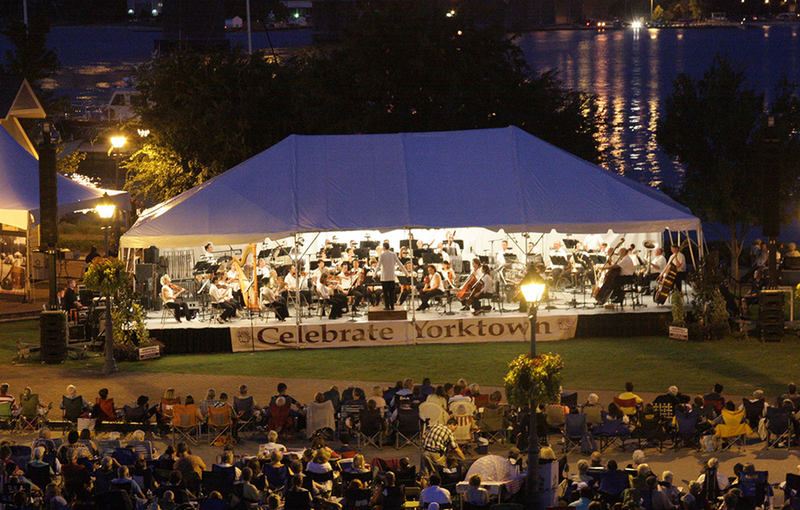 The Virginia Symphony Orchestra, under the baton of Benjamin Rous, returns to Yorktown at 7:30 p.m. on Saturday, August 30, 2014 for its 18th annual outdoor concert. This year’s concert will be held at Riverwalk Landing on Water Street in historic Yorktown. Attendees are encouraged to arrive early with lawn chairs and picnic baskets. A just-for-fun blue ribbon judging for the most creative picnic set-up will be awarded prior to the concert. The award-winning Fifes and Drums of York Town will perform a pre-concert show at 6 p.m. The symphony concert is funded by community contributors from organizations, businesses and individuals along with sponsors, York County, York County Arts Commission and the Virginia Commission for the Arts, whose financial support makes it possible. The volunteer Celebrate Yorktown Committee annually raises $24,000 to present this free-to-the-public evening of music for the enjoyment of the community. • Plan to arrive early as parking is expected to fill up in Yorktown. • Event parking will be available at the York County Courts and Office Complex, Administration and York Hall buildings on Ballard Street, and the Riverwalk Landing Parking Terrace on Water Street. • Please bring lawn chairs and blankets for seating. • Limited Handicap parking available in the lower level of the parking terrace. No rain date is scheduled for the concert. In the event of inclement weather, please call the event weather hotline at 890-3520 for updated information. The cursed will take over Busch Gardens Williamsburg when Howl-O-Scream® opens Sept. 12, 2014 The Williamsburg Virginia theme park will present an all-new Terror-tory™ and will revive a fan favorite show to celebrate the 16th year of this popular fall event. Guests will notice the change almost immediately when they travel through the park’s haunted villages beginning at 6 p.m. A new song was produced this year to coincide with the park’s frightful offering. Rumor has it the song curses its listeners who must survive a night of paranormal horrors at Howl-O-Scream to lift it. Entertainment Vice President Scott Gasparich has one piece of advice for guests when the song plays over the park’s sound system. Playing on the popularity of last year’s addition of Terror-tories™, the park’s scare experts are developing a new area in the park’s New France section called Wendigo Woods™. This new Terror-tory explores the frightful nature of the unknown. Wendigo Woods joins the park’s four other Terror-tories and six haunted houses comprising the park’s main Howl-O-Scream thrill elements. Other seasonal park offerings include Vampire Vogue™, a new merchandise shop in the Oktoberfest section of the park; dining and spirit options like Pirate Baarrrgh™ in the Italy village and Igor’s Fright Feast™ in Oktoberfest as well as live entertainment inside the park’s performance venues. As the park’s teams of startle experts finalize details of Wendigo Woods, another production team is putting a new twist on a popular live production that has been silent since 2011. Monster Stomp™ on Ripper Row is a modern rock-and-rhythm spectacular featuring Jack the Ripper in an electrifying percussion, dynamic dance and sensational singing revue in the park’s Globe Theatre. Like the rest of Howl-O-Scream, the Busch Gardens’ team is ramping up the thrills of every element in this Howl-O-Scream production and encourages parents to think twice before bringing their children to the show. Video-mapping technology, 3-D soundscapes and other technology available inside the Globe Theatre transports the audience to London’s East End where the Ripper’s horrifying acts occurred. Parents and guardians should consider the park’s elevated scare factor when deciding to visit Busch Gardens with young children during Howl-O-Scream. At the stroke of 6 p.m., the ghouls and haunts come out to play and Busch Gardens becomes a seriously scary place. Guests who want the best deal on Howl-O-Scream tickets can lock in a $10/month annual pass featuring Busch Gardens’ EZ Pay Price Lock Guarantee and enjoy unlimited visits to Busch Gardens this fall and into 2015. An annual pass is valid for one year from the date of purchase. Pass members also enjoy discounts to Christmas Town and in-park discounts on food and merchandise. Visit www.howloscream.com/va for details. 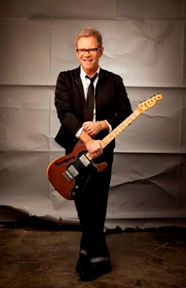 Steven Curtis Chapman will bring a little more glory to the gardens when he performs at Busch Gardens Williamsburg Aug. 23, 2014 Chapman will wrap up the Glory at the Gardens concert series presented by Coca-Cola. Chapman is the most awarded artist in Christian music with 58 Gospel Music Association Dove Awards, five GRAMMYs, 47 No. 1 singles and approaching 11 million albums sold. His latest album, The Glorious Unfolding, speaks of the story that is each person’s life and how they unfold. “The theme was this idea that God will complete the story and in fact, He already has completed it and knows the ending,” Chapman says. Busch Gardens’ Royal Palace Theatre opens approximately two hours before the scheduled 7 p.m. performance. All Glory at the Gardens concerts are included with park admission. For guests’ convenience complimentary tickets are distributed throughout the day at the park’s Guest Relations building. Tickets are distributed one per person on a first-come, first-served basis while supplies last. All party members must be present to receive tickets. Tickets are required for entry to the concert. Purchase a Concert Dining Combo deal online and enjoy an appetizing dinner from any of the park’s signature restaurants and preferred seating for the show in the Royal Palace Theatre. For more information, including complete concert and ticketing information, visit http://www.buschgardens.com/va or call (800) 343-7946. High School Prep Camp is intended for those wishing to achieve more playing time, lower their scores or looking to make their high school golf team. Players should be have some experience as players will be divided into the groups based on a skill evaluation and average scores. Groups will be Masters 70-80, US Open 80-90 and British Open 90-100. Camp will start on Sunday with an orientation, a brief presentation on skill development and defining the golf skills necessary to improve one’s game. Time will also be spent evaluating player’s skill, breaking into groups and beginning the skill development process in putting, chipping/pitching, driving and approach shots. On Monday, Tuesday and Wednesday two hours will be spent in drill stations with the remaining time coaching the players on course. Thursday there will be a brief warm up and 18 holes of stroke play. Contact ed@edteergolf.com or 757-253-0589 with questions or to register. Ed Teer, Director of Instruction and Doug Meredith Head Coach Jamestown High School. Junior camps are a great way to introduce juniors to the great game of golf. During the week the campers will be learn the fundamentals of golf through game like drills, how to play the game, a few basic rules and be exposed to a daily fitness routine. If course scheduling allows, the final day will be on course. Players should be sunscreen, hat, refillable water bottle, small snacks and a large towel. Giving the course a go or hanging out to cheer on others are both encouraged at the Iron-Bound Gym Games planned for July 26 at Eco Discovery Park at Jamestown. The Williamsburg gym held the event in its parking lot last year, but owner Scott Grafton decided to amp up the venue this time around. “People had a blast last year,” Grafton said. Participants will be timed on an obstacle-style course, competing in male and female open and masters age 45–plus divisions, as well as a co-ed division with teams consisting of one woman and one man. The event starts at 9 a.m. and runs throughout the day. There will be food and drinks, as well as a DJ playing music. Fly thru the air at Jamestown Beach…. Welcome to AquaFlight Adventures, home of the highest flying watersports experience! Our certified flight crew is dedicated to providing a safe and fun environment, ensuring a memorable flight. Safety is our highest priority! Feel confident in knowing that our instructors have extensive experience in piloting and instructing flyers. Our flight crew consists of highly trained and professional team members who are certified pilots and flight instructors. We pride ourselves on our high service standards and dedication to safety protocols. To ensure that you have ample time to shake any pre-flight jitters, plan on arriving to our Williamsburg, VA flight center at least 10 minutes prior to your scheduled flight departure time. Upon arrival, you will meet your flight instructor (your co-pilot for the day! ), who will introduce you to the equipment and review the safety instructions. 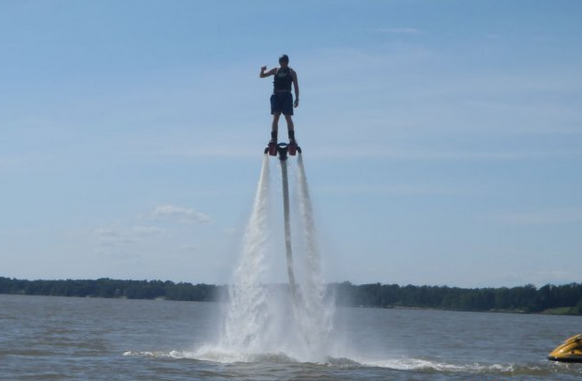 You will then don your provided safety gear– a life vest and helmet and get strapped into the Flyboard or Jetpack. Once strapped in, you will learn how to control your flight and get the most out of your AquaFlight experience. After all the safety protocols are taken care of, it’s time to jump into the water and FLY! Now you just have to remember to smile at the camera and choose an Instagram filter to make you look extra dare-devilish. The PWC (Jetski) provides all of the propulsion for the Flyboard® and Jetpack. The thrust from the PWC is routed through a long hose up to the Flyboard® and Jetpack where a rider can control that thrust to create the type of movement he/she desires. All of the thrust developed from the PWC is routed through the hose, so the PWC does not pull the pilot, rather it just follows behind, the pilot pulls the PWC, giving you the freedom to go anywhere. The Flyboard® and Jetpack has its own buoyancy and therefore floats on the water allowing the rider more safety and easier time in the water prior to start. Be sure to watch our videos to see how this really work. 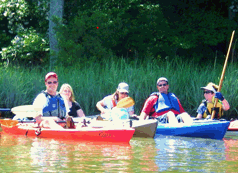 It’s time to BYOK (Bring Your Own Kayak) to New Quarter Park in Williamsburg VA this Saturday, July 19, for our 3rd Saturday, staff-led and FREE kayak adventure on Queen’s Creek. Join Mike Young at 9 am at the softball field, sign in, and then drive to the put-in. The out-and-back paddle takes a little over 2 hours, so you’ll be back to take out your watercraft by noon. The forecast calls for a high of 83 degrees and mostly sunny skies, with a light breeze out of the northeast. You’ll be paddling on the falling tide with a low at about 11:30 am. No kayak? No problem. Call Chesapeake Experience by noon on Friday at 757-259-6859 to rent one for $30. Local disc golf enthusiasts wanted another course so much they were willing to help design and build it. That’s how the new course shaping up at Waller Mill Park came to be, said park manager Michael Van Audenhove. The first nine holes are expected to open later this month, with the final nine projected for completion in spring 2015. 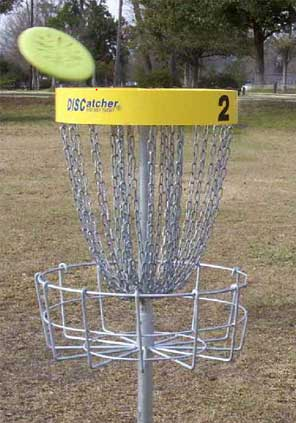 Disc golf, also known as Frisbee golf, is similar to traditional golf but players throw a disc into a basket or at a target. Van Audenhove worked closely with Williamsburg resident John Roy, president of the Colonial Disc Golf Club that recently changed its name from Newport News Disc Golf Club, on the project. 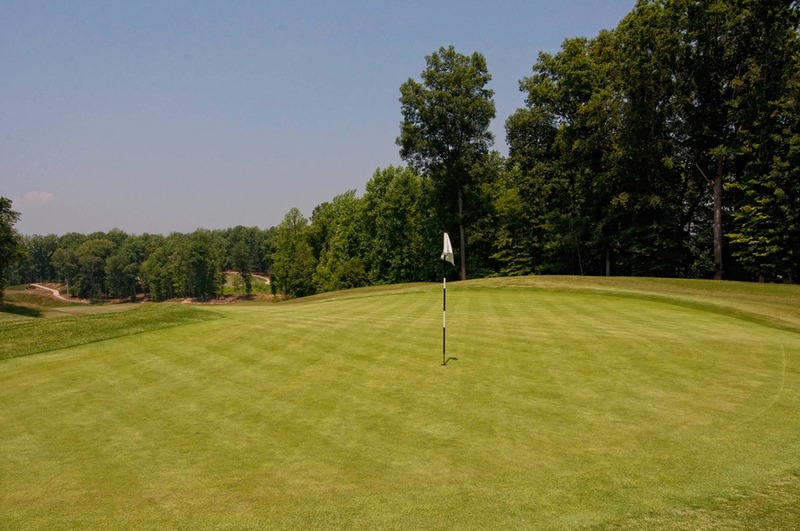 Golfers, if you’re looking for a challenging, well-maintained course that plays true, features five different tees at every hole, and provides excellent food and service in the clubhouse, make Colonial Heritage Golf Club your next outing. Some golfers compare the fairways to carpet, praising them because they’re consistent to play and offer championships conditions, general manager Rich Stanfield says. Yet, the course also poses difficulties with ravines and other forced carries that will help you improve your game. You’ll get the opportunity to see deer, turtles, and other wildlife and appreciate the scenery with streams and hills. “Coming here is like visiting a private club that is open to the public without the private club pricing,” Stanfield says. You can play a round of golf, buy a player’s pass card with discounted rates, plan a tournament, or join as a golf member. All course fees include cart, golfing range and range balls. If you’d rather, you can play nine holes for half the price. “We’re encouraging late afternoon play after work,” Stanfield says. Still not confident? Then you might be a candidate for Colonial Heritage’s Player Development Program, offering monthly sessions with golf pro Josh Alsip. These group lessons give would be golfers who are too intimidated to play lessons in technique and golf etiquette, says Bonny Young, director of sales and marketing. Whether you’re on the golf course, in the pro shop or eating in the clubhouse, you’ll appreciate the service. If you haven’t been to Colonial Heritage in the last year, now is the time to go back. KemperSports took over management of the course and clubhouse and has upgraded quality, maintenance and service to rave reviews. “The staff is very good, very personable,” Crowe says. “If you make a request, they will do everything they can to fulfill it. The folks who man the phones, the wait staff, the events coordinator, they make sure they take care of you. If you’re looking to dine out, The Magnolia Dining Room and Gallery Grill serve delicious food in a casual atmosphere, Stanfield says. Open 10 a.m. to 5 p.m. Sundays, 11 a.m. to 5 p.m. Mondays and Tuesdays and 11 a.m. to 9 p.m. Wednesday through Saturday. On Friday nights in the restaurant and on the outside veranda overlooking the golf course, Colonial Heritage hosts jazz bands and other musical guests, sure, to entertain all ages. Monthly wine dinners on the third Thursday (reservations required) are becoming a favorite for many people, Young says. T he wine dinners are limited to just 30 to 35 guests, creating an intimate atmosphere and exquisite dining as the executive chef prepares each plate. In fact, the wine dinners are becoming so popular, Colonial Heritage may expand the wine dinners to twice a month in June. So, plan to visit Colonial Heritage. The great golf, excellent service and fine food will ensure that your first visit will be the first of many. As a unique event on vacation or here at home, you can enjoy an ideal getaway with your own private party of up to six people on a leisurely cruise along the historic York River. Modern 32-foot Hunter sloop offers a comfortable cockpit, catbird seats, cooler of ice, and “head” restroom. Cruises embark twice a day from Yorktown and Gloucester Point. Here’s an extraordinary gift for an anniversary, honeymoon, graduation or family reunion. Call 757-876-8654 for reservations. Rates are $130 couples, $250 families, $300 groups. For details, go to williamsburgchartersails.com. Bill O’Donovan holds a 50-ton captain’s license with the US Coast Guard. Need sailing lessons? He is a certified sailing instructor with the American Sailing Association. He has undergone sailing instruction by J School in Key West and by the American Sailing Association in South Carolina. He has sailed the York River nearly 20 years, where he teaches an adult class for the community-based Williamsburg Area Learning Tree. 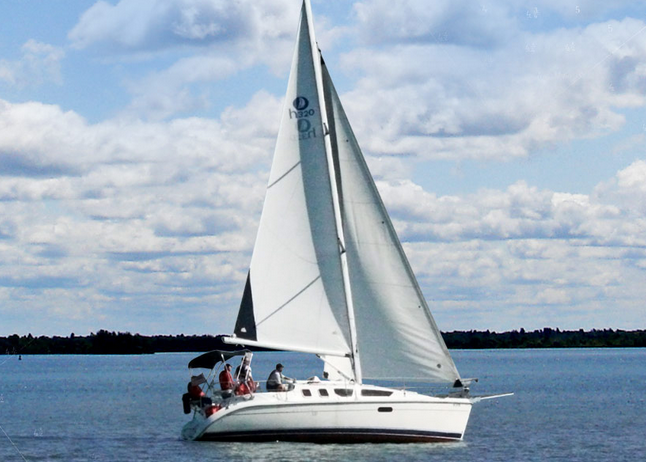 When you join us for your sailboat charter, you’ll sail on a 32-foot modern Hunter complete with in-mast furling and oversized sails for maximum speed. Sophisticated controls reduce the size of the sails to minimize leaning and ensure everyone’s comfort. A giant colorful spinnaker is raised for light downwind running. Yanmar 18 horsepower diesel powers the boat in creeks. With sailing instruction through our sailing school you’ll learn what will enable you to sail most any boat. The boat meets all US Coast Guard standards and has shipshape equipment, including color-coordinated lines and well-marked blocks. With our many charter sailing options, we have the right tour whether you’re visiting our area from out of town and in search of a unique vacation adventure, an employer wanting the perfect corporate retreat or a local looking for a fun family chartered sailboat trip. Great article in Saturdays Gazette about the Williamsburg Community Pool. It is one of several that families can join for that old fashioned pool experience. I get a number of inquiries from prospective Williamsburg home buyers who ask what neighborhoods have pools. Surprisingly there was no list so I had to create one. Another surprise is that there are over 62 neighborhoods to choose from in the area with swimming pools. In addition to the Williamsburg Community Pool , a number of the neighborhood pools allow families to join even if they don’t live there. Windsor Forest,Kingwood, Kings point, First Colony, Queens Lake, Indigo Park all welcome out of neighborhood families and renters to join both their pool and swim teams. 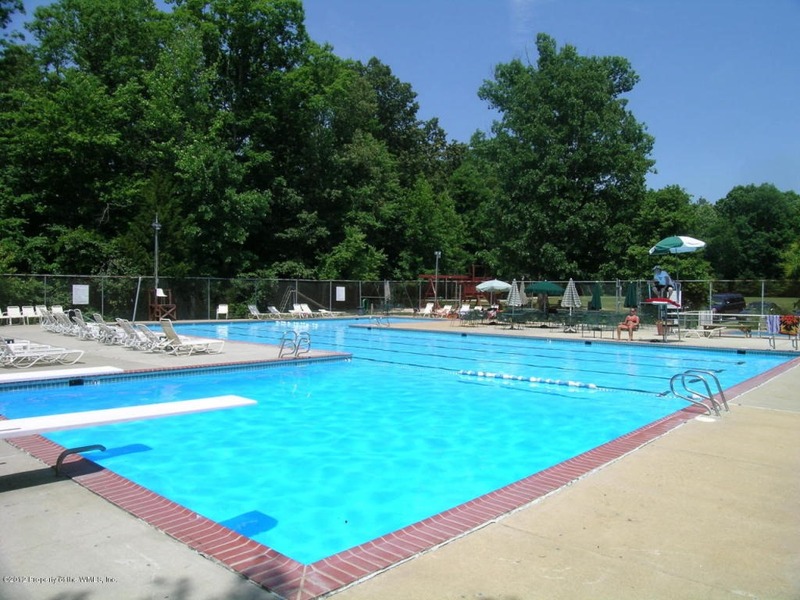 Other options include the James City County Pools at Chickahominy Riverfront Park and Upper County Park. Kim Wheatley paused from her afternoon swim at Williamsburg Community Pool Wednesday to comment about why she enjoys spending time there. It is that spirit of family and camaraderie that seems to be at the crux of the pool community. Next year, the pool, which is nestled in a wooded glen in the rear of the Williamsburg Shopping Center near Ace Peninsula Hardware and the Virginia Regional Ballet, celebrates 60 years. Some people have been a long history at the pool, watching generations learn to swim and take part in activities. Tom Mainor has been a member for more than four decades. “It has been a great place for the children, and now it is great for the grandchildren,” he said with a smile. Competitive swimming is HUGE in the Williamsburg, VA and peninsula areas. The summer swim teams are part of the VPSU -Virginia Peninsula Swimming Union. There are divisions consisting of 19 teams from Williamsburg, Yorktown, and Upper Newport News with over 1000 swimmers competing. If you want year round swim team options for youths WAC ( Williamsburg Aquatic Club) and Coast Guard Blue Dolphins are the teams to consider. BOTH WAC AND THE COAST GUARD BLUE DOLPHINS SWIM TEAM OFFER A COMPETITIVE USA SWIMMING PROGRAMS FOR OUR LOCAL COMMUNITIES. THESE TEAMS EXCEL AT LOCAL, STATE AND NATIONAL LEVELS. Here is the neighborhood list. You can search homes for sale , active adult communities, 55+ communities, condos and townhomes , land and commercial property for sale in Williamsburg, Yorktown, New Kent, Poquoson, and Gloucester, VA as well as surrounding markets. I look forward to serving your real estate needs ! 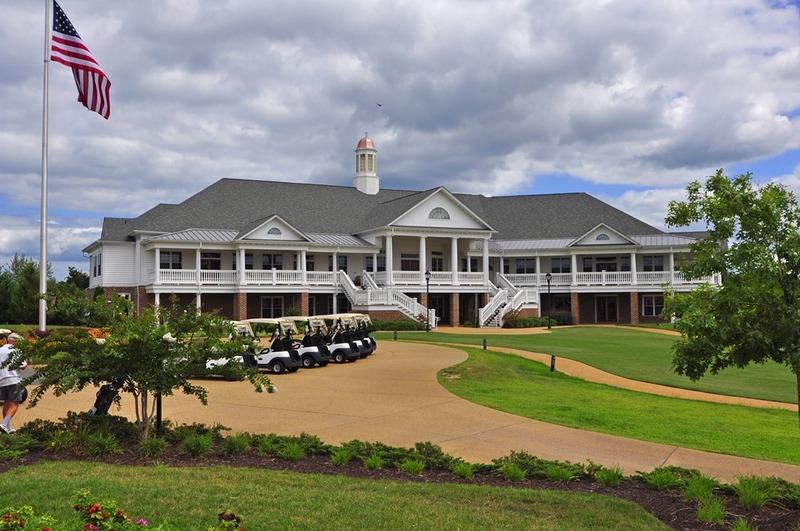 Colonial Williamsburg’s Golden Horseshoe Golf Club, Spa of Colonial Williamsburg, Williamsburg Inn lawn bowling club and tennis courts will host an open house from 11 a.m. to 6 p.m. Wednesday, June 18. Guests can register at all four locations to win a $50 Colonial Williamsburg gift card and can renew or purchase their Good Neighbor passes at the Golden Horseshoe clubhouse. Guests who visit the retail shops at the Spa, tennis courts or golf course will receive 25 percent off their purchase on the day of the open house. Members of the Williamsburg Inn lawn bowling club will be at the bowling green to demonstrate the game that dates to 13th-century England. The Spa will offer tours of the fitness facilities as well as information on services offered. The tennis pro will offer information on lessons and membership in the tennis club. Golf cart tours of portions of the Gold Course will be offered throughout the day. The Spa, Golden Horseshoe and Williamsburg Inn tennis club will also offer specials that will be renewable through Sept. 5. Guests may begin their open house experience at any of the four recreation locations and may choose to enjoy lunch at the Gold Course Grille, open daily from 11:30 a.m. until 3 p.m. 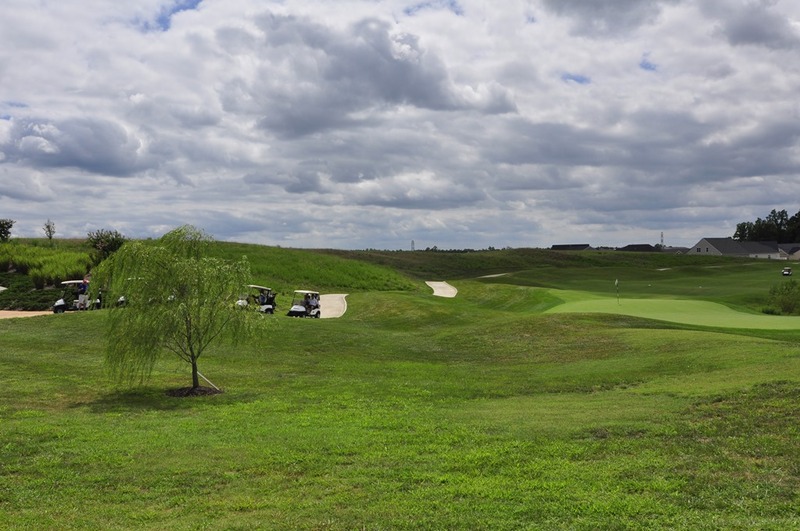 The Golden Horseshoe Golf Club is located at 401 S. England St. The Spa of Colonial Williamsburg is next door to the golf course at 307 S. England St. The Williamsburg Inn tennis club is located adjacent to the Inn and the lawn bowling green is located behind the Inn, at 136 E. Francis St.
As almost 1,000 athletes head into town this weekend for the Rev3 triathlon, officials are trying to head off the widespread outrage race-related traffic snarls sparked last year. And while more than 900 people have signed up for the race on Sunday, that’s down to about half of last year’s attendance. Williamsburg Boat Club will launch a youth rowing program in the fall of 2014. The program is open to high school students and will be held the first week of school and will continue through the Thanksgiving break. A second session will start in March. Both seasons will include three races. Practices will be held five days a week from 3-5 p.m. at Chickahominy Riverfront Park. There will also be two summer rowing camps. 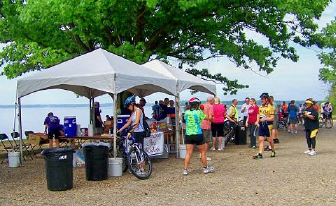 Bicycle, jog or walk along the Colonial Parkway on Saturday May 3rd 2014! When: Saturday, May 3rd 2014 from 8 AM to 1 PM. Where: Pedal the Parkway is held on the Colonial Parkway section running from Williamsburg’s Newport Ave entrance to Jamestown. What: Pedal the Parkway will be held on Saturday, May 3, 2014. 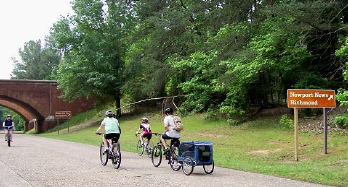 The National Park Service closes the Colonial Parkway to motor vehicles from Williamsburg to Jamestown for cyclists, runners and walkers of all ages to enjoy a car free Parkway. In 2012, over 1000 people enjoyed the beautiful scenery along the Parkway during this event. New in 2014, an Outdoor Activity Expo located at the ECO Discovery Park will be held to promote outdoor recreation and healthy living activities. Who: Your local bicycling club, Williamsburg Area Bicyclists (WAB) is once again organizing the 17th Annual Pedal the Parkway to provide an enjoyable experience along the historic and temporarily car-free Colonial Parkway. Why: Fun, free, and family-friendly alongside the beautiful James River. Non-competitive, start at your own time, go at your own pace. Free bicycle helmets for children at the ECO Discovery Park while they last. Suitable for young families, special-needs athletes. 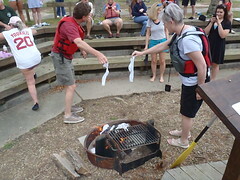 The Burning of the Socks got a lot of buzz at York River State Park two years ago. This quirky tradition of sailors in the Annapolis, MD area was a great way to start the Canoe & Kayak Season and the first guided paddling trip of the year. Last year’s cold weather kept people away from the water. We will not let one bad year kill our new tradition! Get your gear ready and an old, worn, and ugly pair of socks prepared for the fire. The Burning of the Socks will be held on Saturday, April 12th with the festivities beginning at 10:00 a.m.